Financial markets have finished in positive territory on the last week. It seems like the market is slowly but certainly shaking off the worries about rhetoric announcements by Donald Trump and Xi Jinping that might result in a trade war. As indicated in a previous week’s market review there have been no tariffs imposed yet and thus, the volatility will likely to remain higher until the two biggest economies finalize their trade relationship. The stock markets have taken a careful approach to walking the stairs up in a current consolidation. 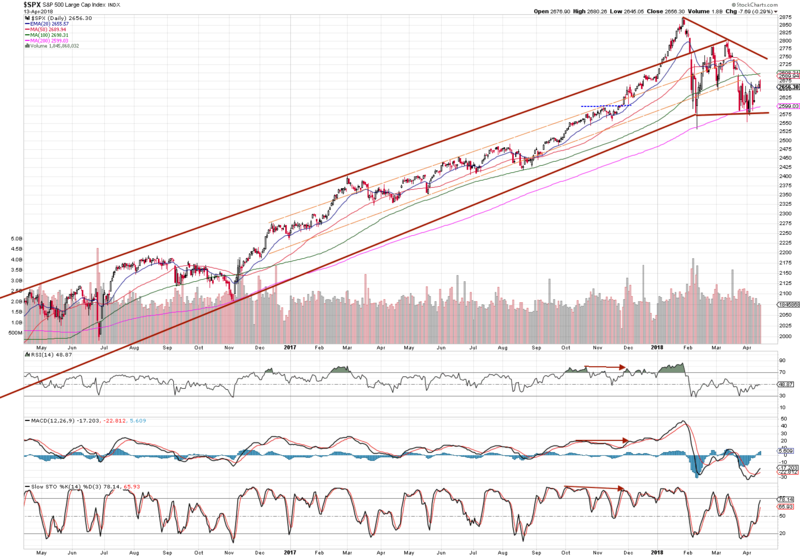 Last week I have depicted a short-term trading setup of Nasdaq with its support and resistance levels to watch. This week market review shows that trading time can begin. 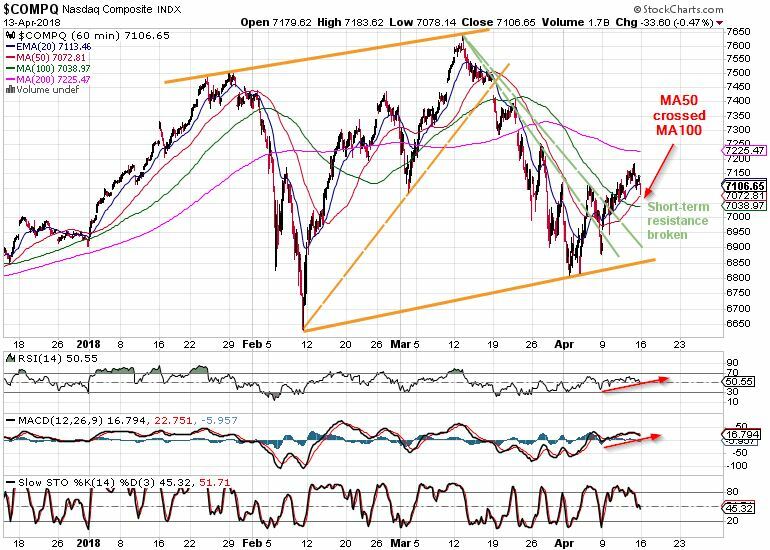 Below is a 60-minute chart of Nasdaq, the wide orange lines depict a channel of current correction and all dashed lines show broken trend lines. As you can see, the price broke the resistance trend lines (green dashed) and 50 SMA has crossed the 100 SMA up again. RSI and MACD just slightly above 50 confirming the price level at the moment. Nasdaq is likely to slide on the 20 EMA / 50 SMA in the following weeks and thus, this is the best time to invest in the good quality stocks. The index completely lost its outer and inner trend. At the moment it’s hard to determine the support and resistance levels. The consolidation persist. 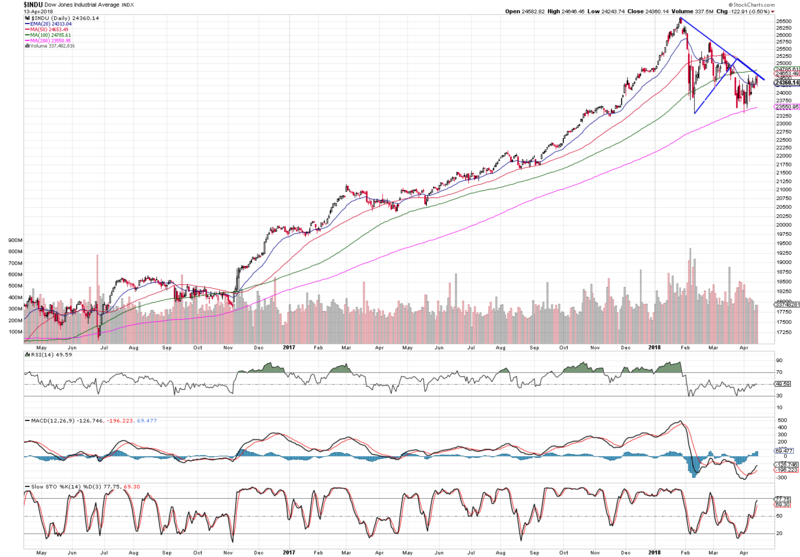 Dow has failed to complete a symmetrical triangle recently and dipped down to the 200 SMA. At the moment it is about to pierce a three-month resistance depicted by a blue line. 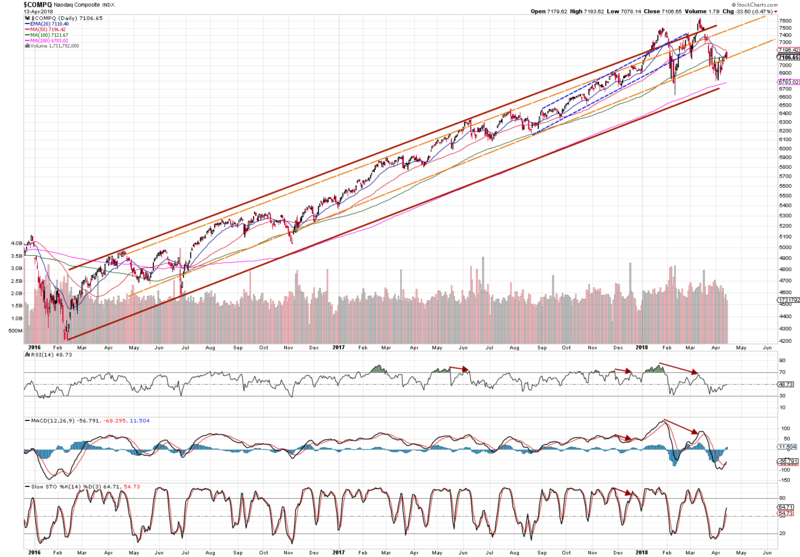 The best performer has re-entered the inner trend channel (orange dashed lines), which is actually an important truth. Most of the trading activity during last two years was happening within this range. The FTSE index continues in a two-week rally now. This is a good sign that will certainly bring good opportunities when investing overseas.